…or a liberal hoax after all. Granted, human memory can be a leaky sieve and the tendency to make things markedly WORSE or BETTER “when I was a boy” is pretty common. But here is a way to put facts (remember those? They were once in everyday use) behind your avuncular stories to the kiddies about it being cooler of a summer back in the Old Days. Want to see how summer temps have changed in your home town over your lifetime? Go to this NYTimes page, punch in your date of birth and where you were born (or another city of interest) and see the graph. The orange shading is margin of error, the solid line the point of central tendency. 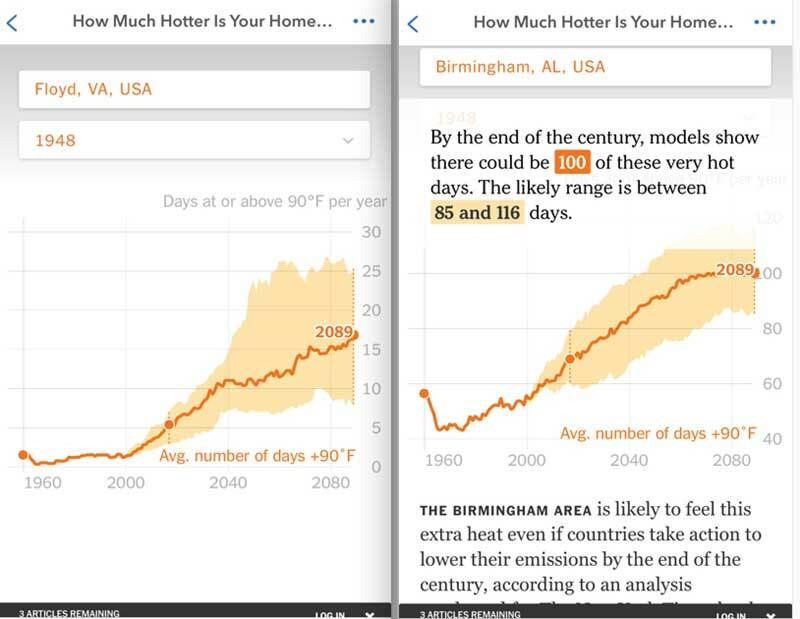 And you can view birth year to today, then birth year to the end of the century (pictured above) under currently-predicted warming patterns and anticipated greenhouse gas accumulation that will push us toward or past 500 ppm of CO2 by 2100. And viewing said facts and given my aversion to heat, moving to Floyd from Birmingham was a wise thermoregulatory choice, don’t you think? And it is even COOLER than Floyd here on the Creeks. Is it me or the older i get the more heat has a bad effect on me im 65 and retired i worked in the hay fields all summer no shoes and shirt most of the time for 25 cents hr from day light till way after dark and dont remember it being this humid or hot so wheather has changed . I read in my bible that this would happen before the end of the world so the world hasent seen anthing yet and i belive my bible Fred . Sorry for Birmingham! But does this graph say Floyd currently has 5-days a year over 90-degrees? I don’t recall more than 1 or 2 days in the last 10-years. On our mountain top in Willis, it’s rarely above 85 degrees. I guess I should consult our local records! The LOCAL climate where you live, Becky, and where WE live is cooler than Town of Floyd proper where the “official” records for the county come from. And for that I am thankful. We watch the thermometer in the car fall from 87 up top to 79 at the house not unfrequently. Next Next post: WHY SWEAT THE INVASIVES?